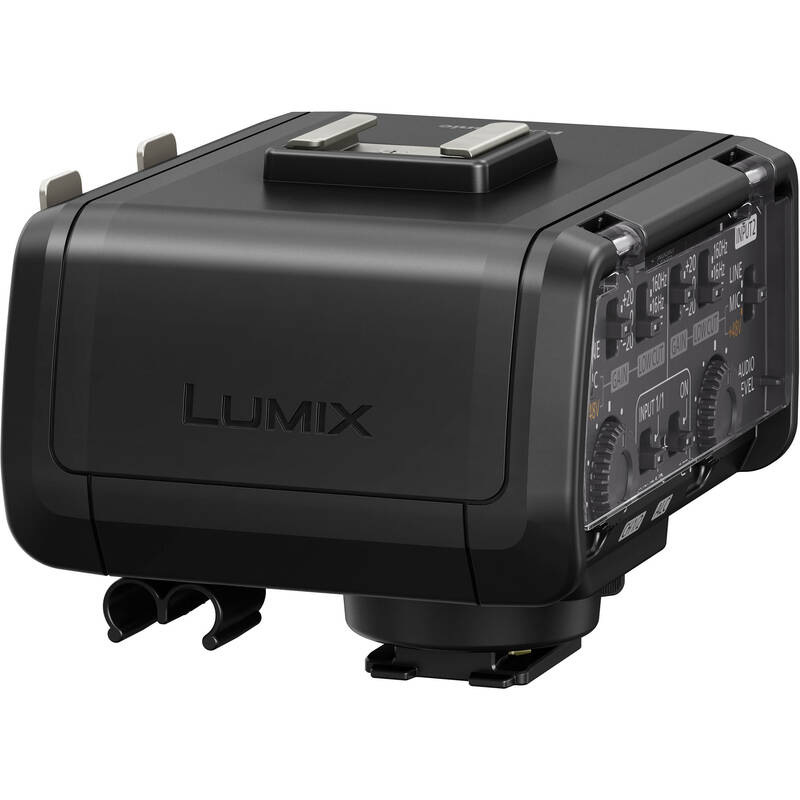 Expand the audio capabilities of your DC-GH5 mirrorless camera with this shoe-mounted DMW-XLR1 XLR Microphone Adapter from Panasonic. It connects to the camera directly through the hot shoe and provides two XLR inputs for using professional microphones. It also features a control panel with a clear cover that sports numerous physical dials and controls for changing the levels, gain, and low cut filter of each input individually. Also, it supports high-resolution recording formats up to 96 kHz and 24-bit. A cable clamp is present as well for cable management and a shoe mount on the top of the unit can support additional accessories. Additionally, it receives power directly from the camera. Box Dimensions (LxWxH) 4.8 x 4.1 x 3.4"
DMW-XLR1 XLR Microphone Adapter is rated 4.8 out of 5 by 19. Rated 5 out of 5 by Greg from Great unit for GH5 This is a must have accessory for the GH5 if you do a lot of audio recording, especially interviews or situations with multiple microphones. It functions like the audio input selection on a traditional camcorder. The only draw back is that it has to be used on the GH5. Panasonic should have made a tether cable so it could be moved to another mount, or an audio out jack to use on the input of a GH4. Note, not all a audio settings are available with this unit as of 6-29-17. The highest frequency and bit rate is with .mov files, not mpeg. Still a great unit, relatively quiet, and is so much better than plugging a mic into the camera body. Rated 5 out of 5 by Matthew from SO WORTH THE INVESTMENT Ok, this is not going to compete with higher end DAR... but it is on par with most of the typical DAR that you see on the market for DSLR shooting, it sounds WAY better than the DSLR can record, and is easily useable for main audio in a great variety of projects. ?I switched seamlessly over to using this instead of recording to my Zoom H6 without any noticeable degradation in the audio quality. ?I imagine there are SOME limitations, for example a reduced dynamic range... ?but lets face it, this product is one of convenience. ?For a single shooter, this means less wires, better audio direct to camera, and reasonable quality recording for the great majority of your smaller projects. ? ?I would buy this again. Rated 5 out of 5 by Anonymous from This is the XLR Adapter you are looking for. Does exactly what I need. Has all the onboard functions needed for recording. Sound is excellent with a MK-416 plugged directly in. Unit is light. No complaints. No need to use my low noise preamps any more. Only (very slight) issue I have has more to do with physics than it does with Panasonic. You really can't put the adapter and mic on top of the camera when using it on a gimbal. Was hoping that I could somehow balance it with an RF receiver instead of the shotgun mic, but it was just too top heavy. Rated 4 out of 5 by Aric S. from Great product to get two XLR inputs on your GH5 I have only used this twice so far, but I really like it. I am able to plug in two wireless receivers and use lav microphones for my actors. I have been able to eliminate a boom mounted microphone when 2 or less actors are in a scene and the environmental noise is acceptable. I LOVE the ALC control as I can set the lav microphones pretty hot and the ALC eliminates any digital peaking from the signal. I really have gotten great audio this way. In fact, it is often better audio than I get from an amateur boom operator who does not know how get levels right or the does not know script well enough to get the mic on the proper actor at the proper time. Pros: Great audio and excellent Automatic Level Control (ALC). Makes the GH5 into an audio powerhouse. Eliminates the need for external recorder and syncing in post. Cons: Expensive for what it is, but still worth it. Wish they had a cable to allow of-camera mounting. Mount is made of plastic and not as tight as I would like. I am hoping it holds up to heavy use. Rated 5 out of 5 by Christopher from Don't know how I lived without it I don't know how I lived without this. Shot Dual system sound with a H4n and had to sync everything. No more, sound is excellent and the controls panel is extensive. Clients very happy! Rated 5 out of 5 by Erik S. from Works just as it should Does all it says it should, and does it easily. Audio sounds clean, and phantom power works fine. I don't notice any serious drain on camera battery. Solid enough that I've run a SmallHD Focus on the top during a shoot and it felt solid (though a bit awkward). This saved my bacon on a shoot once where the 1/8" audio solution failed. Just popped this on, went to shotgun mic and moved on. Great product. Rated 5 out of 5 by Guttorm from I would buy this product again....... First i bought the Panasonic DMW-MS2 shotgun microphone. But in my experience to much background noise with this.If you are serious when concerning audio, buy this microphone adapter instead and get very good and clean sound with a good microphone. Rated 4 out of 5 by Justin W. from Very cool but doesn't lock down tight enough This is a AWESOME little gadget but it doesn't lock down tight enough to the hot shot to prevent slipping when you have a mic on it. It's not going to fall off but it doesn't feel completely stable. Otherwise, really cool addition. Does this allow audio recording during VFR mode? Sorry, audio recording is disabled when shooting at variable frame rates. If audio actually was recorded, it would be so slow as to be unusable. The audio you hear in films during slow motion sequences is created. I can say from many slo-mo shots I have participated on the sound generated in real time is not very interesting. However, you can then take that sound and create meaningful effects in your editing. So this actually receives an audio signal through the hot shoe? I don't need to plug a 1/8 cable into the camera like other mic adapters I use with the GH4? I need to buy a cage for the entire setup but there are no dimensions for the Mic adapter to get a total size to work from, what are the measurements? I bought the Zacuto cage for the GH5. It works great but is not compatible if you're using the additional GH5 battery grip which is a shame. If you running and gunning and don't mind swapping out batteries the Zacuto cage is light but very sturdy. I like it a lot. Is there possibilily of a 3 channel setup? Would you still be able to use a rode mic pro with headphone jack going to the camera mic input, then use the 2 XLRs for wireless lavs. No, you cannot have a 3 channel setup. Are there any sort of adapter cables available that offset this unit as it interferes with the cage handle? The DMW-XLR1 XLR must be in the hot shoe of the GH5 in order to function. There is no way currently to allow it to be mounted elsewhere. All is not lost for you can consider an XLR Audio Adapter such as the Beachtek DXA-SLR Pure Passive Audio Adapter for DSLR Cameras B&amp;H # BEDXASLRPURE. This can be mounted independently of the camera on the cage. Then you run a cable from it to the camera. Or you can consider a independent recorder that will give you the best possible sound. (The audio from it can also be recorded in the camera as well.) Here is one possibility. Tascam DR-60DmkII 4-Channel Portable Recorder for DSLR B&amp;H # TADR60DMKII. If you have further questions, please write us at: provideo@bhphoto.com. Sorry, Panasonic designed this to only work on the GH5. I have a cage for my GH3 and would like to use it on the GH5. Will there be some type of adapter to plug the XLR1 in the mic port ? Nope. You're going to have to upgrade your camera. Does it use the Battery from the camera or does it house Batteries inside the unit? It is powered directly from the camera. It does not require batteries.